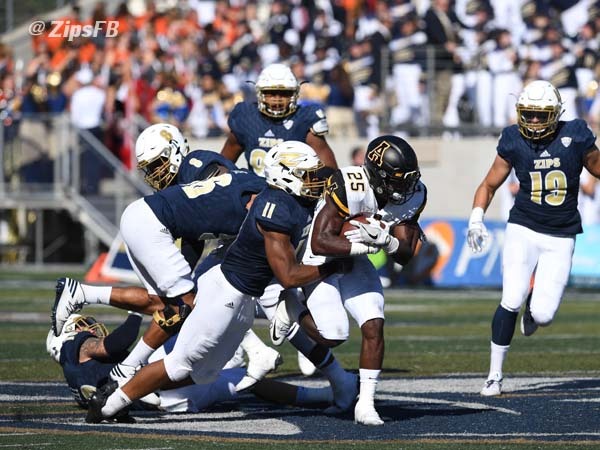 AKRON, Ohio — Quarterback Taylor Lamb personally challenged himself this week to play at a higher level as Appalachian State faced a key road battle at Akron. And with his father Bobby watching from the stands, the heady junior directed the Mountaineers to a 45-38 victory over the explosive Zips before 15,381 spectators at InfoCision Stadium. Lamb directed his offense to a season-high 587 yards, hitting 22-of-30 passes to nine different receivers for 280 yards and three touchdowns passing and added a one-yard scoring burst with one second left in the first half as App State (2-2) turned its 14-10 second-quarter deficit into a 31-14 lead. The Mountaineers held on in the second half as Akron QB Thomas Woodson (31-of-43, three TDs and two interceptions) led the Zips on their furious comeback. Akron (2-2) cut ASU’s advantage to one touchdown twice in the fourth quarter, but couldn’t get any closer. Appalachian sophomore tailback Jalin Moore, subbing for an injured Marcus Cox, also came up big with career highs in rushing yardage (257) and carries (39) and added two important touchdowns on runs of 49 and 32 yards in the second half to help polish off the win. Moore’ performance was the sixth-best rushing game in school history and he tied Damon Scott (1996 against Western Carolina) for the fourth-busiest ball-carrying day by a Mountaineer. Moore also hauled in three passes for 17 yards to give him 274 all-purpose yards. It was a difficult day for defenders, as the two teams combined for 1,073 yards, 11 touchdowns and 83 points. But the Mountaineer defense had enough in the tank to stop two Akron drives with interceptions (by cornerbacks Clifton Duck and Mondo Williams) and force a field goal on one Zip possession in the red zone. Duck a true freshman, also led ASU with 13 tackles — nine of them solo stops — and added a pass breakup to spark the defensive effort. With App State clinging to a seven-point lead when it failed to convert on its third-and-three at the Akron 33 when a first down could have clinched the game, the Mountaineers’ beleaguered defense thwarted the Zips’ final possession in the last 2:12 of the contest. After Appalachian’s only punt of the game sailed into the end zone to give Akron the ball at its own 20, defensive end Tee Sims sacked Woodson for a four-yard loss on first down and then Woodson misfired with an incompletion to receiver Jerome Lane. Woodson’s third-down aerial to Anthony Lauro was completed at the sideline for just five yards to leave the Zips with one remaining play at the 21. It ended in disaster for Akron when Woodson lost his footing as he scrambled away from pressure, bumped into blitzing linebacker Dezmin Reed and fell to the ground for a loss of seven yards and ASU’s fourth sack of the game. Appalachian ran two plays from victory formation to kill off the remaining 66 seconds and escaped with its hard-fought victory. With its tough non-conference slate now complete, Appalachian will now pursue the one goal that evaded the team last season — winning the Sun Belt Conference title. That task begins next Saturday with a noon home game against Georgia State. The improving Akron program, meanwhile, will turn its eyes towards winning a Mid-American Conference crown, but the loss to App State will sting for awhile.